Each facet of the Moog Model 15 modular synthesizer has been meticulously recreated in this application to ensure the power and transcendent sound quality of each module remains intact. The character, harmonic complexity and mystique of the Moog Model 15â€™s modules, from the legendary Moog 921â€“series oscillators and 904A Low Pass Filter, to the coveted 907 Fixed Filter Bank have been painstakingly preserved. 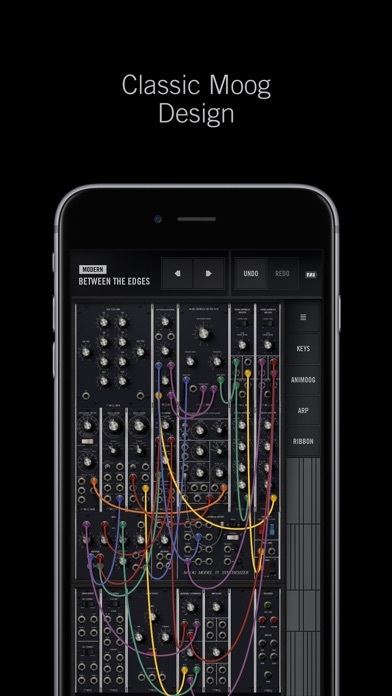 In order to develop the most immersive and expressive modular interface possible, the Model 15 App has been designed utilizing Appleâ€™s new Metal advanced graphics engine. This ensures that all zooming, panning and modular patching throughout the application feels completely natural, something that would have been impossible otherwise. Because the Model 15 App utilizes Appleâ€™s Metal technology, only 64-bit devices are supported. Compatible devices include iPhone 5s or newer, iPod touch 6 or newer, iPad Air or newer, and the iPad Pro.